the Diaspora or dispersal is a key factor in their survival. The Nazi terror is a case in point It came up with the "final solution"
battle to survive not only as Jews but also as Sephardim, continues. centre of our lives and activity. repatriated home and discharged on the 30th January 1946. He rejoined the Motor Trade in which he had started in 1934.
consecutive years which included the Golden Jubilee Year of 1981.
has been a very active member. He is a keen golfer and has served as Captain of Wingate Golf Club. More recently, however, he has become an enthusiastic bowler. Saturday mornings and still sings in the choir, one of his great joys. occasion of their Sixtieth Anniversary. the benefit of all our people, both here, Israel and the world over. attaining 60 years of service to their Community. anniversary and give our Best Wishes for the future. heart and soul to our Maker who dwells in this sanctuary. they should learn and fear the Lord". and to convey the message to their children. other, love each other and be responsible for each other. us, can our community go from strength to strength. by which we may come closer to you." country at the time and it continues to be so to the present day. Jewish expression and the continuity of our customs and traditions. Our celebration of our 60th Anniversary falls on the eve of 1992.
revival of great love and intense pride in our language, Ladino. was to flourish and become the Sephardi Hebrew Congregation. old man planting an oak tree. their fruit I am doing likewise for those who will come after me." taking place in the Palace Theatre on Sunday 18th October 1931.
scrolls) which adorn and grace our Ark. the tree and founded our Sephardi Hebrew Congregation. Camillo Chldumba (26 years), James Muzawazi (22 years) and Paul Nyahotsi (18 years). In 1 944 Mr. I.R. Rosin approached the Chief Rabbiof CapeTown, Dr.
community grew, so the need for a Rabbi became more pressing. years of distinguished and selfless service. From the beginning Dr.
Papo took a keen interest in the affairs of the young congregation. He introduced children's services and brought out news bulletins. the development of the community. of the best nursery schools in the country. initially the dual purpose of synagogue and community centre. with a warm dignified interior. with the Governor of Southern Rhodesia, Lord Dalhousie. officially opened on Sunday 13th May, 1962. Sephardi community in Zimbabwe grew from strength to strength. ahead will allow it to gather strength and build its numbers again. are Sam Hanan and Allegra Trevis. bitterness, good and powerful things grow. countless sermons to his congregation. (Samora Machel Ave.) and the first Sephardi Hall erected. Manfred Papo who came to Rhodesia in 1944. Dr Papo was an Austrian, considered in theory an enemy alien. Saul Alhadeff and Salvatore Alhadeff." which members of the Christian and Jewish faith exchanged views. centre become brick and mortar. consecration of the synagogue in 1953. The building was packed. Gaon assisted by Dr Papo. in their own separate ways towards the greater glory of Judaism. alike is that Judaism is not a dogmatic religion but a way of life. Sepharim were donated in the 1970's to the Sephardl communities in Cape Town and Johannesburg. donated by congregants in memory of relatives. bestowed upon him by the committee in 1980.
here and in later years as a clothing manufacturer. were married in the Salisbury Street Synagogue. R. Benatar, B. Krikler, E. Bondi, S. Piha and D. Hasson. Israel and were not available at time of printing. traditions of our faith and our forebearers. extend greetings and good wishes to the Congregation. efforts presently being made to safeguard our rich heritage. occasion of your 60th Anniversary. which a cotton wick is placed. Amelie Benatar- a position she was to fill for six consecutive years. serving member of the society. which keeps the day to day running of the community so well oiled. Rachel Hanan, Suzanne Alhadeff and Betty Rodman. Not In photo: Stella Cohen. where she was born on June 13th, 1893.
brought out by her brother Mr B.S. Leon in 1920.
still a member and sings regularly at the Shabat evening services. attracted the adult members of the congregation. Arenson, Mr Leon Hanan and Mr Jack Benatar. "Shema", a tradition he has kept for over twenty years. Leon, Avron Alhadeff, Mary Levinsohn. Inset Esther Arenson and Stella Alhadeff. A optimistic report on the future 2"e t eo hon ue J ar H.
has been given by Dr Solomon Gaon, gou toard of e a dabal f e the en l s.
V Sephardi and Ashkenazi (communi- particularly pleased that 45 per cent of Mr David Kay and Mr I. R. Rosin, th 1.ue *"-g ChriSt n eCoa. Raphael Mizan, Isaac Menashe and Salvo Hanan. Inset: Eddie Hasson, Victor Hasson, Marc Dozetos. tribes of Israel, and behind the curtain Is the organ which accompanies the choir during weddings. Raphael Menashe and Leon Hanan. Codron and Mrs Rosalie Hasson. small towns and villages dotted along its picturesque coastline. who perished in the Holocaust. was a Jewish community there. encountered a Jewish community of about 400 people on Rhodes. Kr;ights of St John during the siege. most numerous, influential and cultured Jewry of the middle ages. months in which to settle their affairs and leave the country. Middle East, the Ottoman Empire and Western Europe. Island rejoiced and returned to openly practicing their faith. 1. Exemption from taxes for 100 years. 2. Enjoyment of the profits of sulphur mines in Rhodes. N611 ICLOtlU :OH SAS ,. RLt ,r..RCSoOS l OU k i '. ;4S 0 $ t ,"
between the Romaniot Jews and the immigrating Sephardim. forced to.convert to Islam or face death. rights and privileges of the Jews in Italy. the only reminder of a Jewish presence. stroll along the sea front and enjoy refreshments at the restaurants. owing to poor support it was closed in 1897.
which had formerly been used by the Community for Talmud Torah. in Hebrew and Ladino date back one hundred years or more. customary to visit them on Lag B'Omer. custodians of any records belonging to the Juderia). that I spent my idyllic childhood. We all enjoyed our religious festivals and lived from one to the next. as the sounds came, loud and clear. the age of nine, he left Rhodes. of that island are treasured ones. Ladino, and its religious traditions. meagre family income of my grandfather, a poor shoemaker. excommunication putting a razor to his beard when attacked by medieval armies. shown against a cold cloudy winter sky, with no trace of tourists. course the "burmuelos", dipped in honey. our daily contacts with those people. of them for my mother to crush and make "Zitunas Chakiste". asked to go up the minarets and chant out the Muslim call to prayer. considered the Jews as the people of the "Book". Dr. Hasson and Dr. Gaon. square were burnt down in the 1920's and has been known by the Jewish community by that name since. coming in with such fury and dashing themselves against the rocks. I dared not take one step out of the house, so terrified was I.
forefathers "qui sus almas reposin in pas, Amerd"
used It was situated between the Jewish and the Turkish Quarter. every home in the Jewish Quarter had water and electricity. home of Mr Nissim Trevis. worked in the bank of Salamon Alhadeff. inscriptions are in Hebrew, French and Greek. families of the Rodis Community. JuAumFF oAITT FIERA ISAmSt 5 Ar..
ANATO DAVID HAMAN WSSM ILW T4 . -sas aA Ao asoS. raae mans.ssa 1.. AIM ALAH AM NAI1 31I10,I S "
soap with the markings "Pure Jewish Fat". the inmates of Auschwitz concentration camp. fluctuated between alternate periods of isolation and persecution. flourishing Jewish community, with its close family ties, began. the time. It was when the SS arrived that the Nazi tyranny began. labour camps on Rhodes No mention was made of deportation. was betrayed by the Greeks and shot by the Germans. and left baskets of food at the door. onto boats A seething mass of humanity was packed like sardines. they only travelled at night, and the journey took about eight days. sea. They also allowed them to use the boat's cooking facilities. train journey to Auschwitz, only to die in the gas chamber. where they remained for the whole day without food or water. was raw and bleeding. Today she still has scars from that brutality. The wound bled and festered for a number of days. would hide under her sisters bedclothes and talk to her for hours. bike. All gassing and cremations would stop immediately! infamy such as Bergen-Belsen, Mathauzen and Dachau. Hasson were killed because they could not continue. 1945 they decided to escape from the Russians. up exactly where they had started, having completed a full circle! emigrating to the Belgian Congo in September 1946. Leon Hanan. In 1953 they were married and settled in Salisbury. had happened and that it should not be forgotten. cake of soap from Auschwitz, with the markings "Pure Jewish Fat". Island on 10th December 1927.
where he was forced to work in a coal mine. joined other Rodislis survivors in Bologna. moved to Salisbury (now Harare). been the Gabbal since 1985.
endowed with beauty befitting God." perished in the gas chambers. we had not Initially understood the trauma of the bombardments. wartime Rhodes, these were our playthings. discovered that-all our neighbours' chickens had disappeared! held at the army barracks with the rest of the Jewish community. can't help feeling "Why us?" thereforas long as she could remember. The third category are the names of people who emigrated to Rhodes from Turkey and Greece after the first World War. The entrance to the Mandraki Harbour with the Fort of St. Nicholas in the background. now used as a lighthouse. was my second visit to this holiday Mediterranean island. feeling of affinity for this place. the street gives one the impression that this is part of Jerusalem. I walked up three steps and was in the foyer of the synagogue. Nissim Benveniste. She did not remember them. names of all those who perished in Auschwitz. ceiling hang some magnificent chandeliers. centuries of persecution and adversity. The early morning sunlight falls on the KayAncha, with the "Fuente" in the foreground. 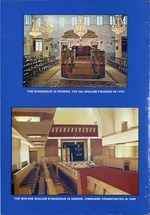 synagogue was restored to its former glory. surviving document of the Jews of Rhodes. Dodecanese Of the six, four were survivors from Auschwitz. Trevis, the nephew of Mrs Sol Trevis, and his family. Albert decided that we should have a conducted tour of the Juderia. conditions. He returned to Rhodes for the first time in 1962. We moved on to the Kal Shalom. Here, we were greeted by M.
with emotion, almost in tears said, "They are not here anymore." the sign "Hotel Cava D'Oro." all meet again at the Kal Shalom for the Shabbat evening service. Behor and Jacov Leon, the latter being my grandfather. "Don't worry, I will know who you are." Friday night and this I happily accepted. residents present Mr Maurice Sorriano, Sammy Modiano and Mme. tourists, commemorating family and ancestry. register for the cemeteries of Rhodes. along the line the prefix had been dropped. 21 st February, 1936. Professional photographer. Keen on historical and archival works. fortunate to have met some of my family. Grand Masters, Villiers de I'lsle Adam, was compelled to surrenderthe island to Suleiman the Magnificent. Mazaltov Benatar, the younger generation of whom, emigrated to Rhodesia. who was not bor when the photograph was taken, is part of this family and at the age of 87 Ia still with us. Milky Way. Properly the Jew ought hardly to be heard of; but he is heard of, has always been heard of. out of proportion to the weakness of his numbers. mortal but the Jew; all other forces pass, but he remains. From the article "Conceming the Jews" by Mark Twain. DOES THIS AUTHOR HAVE THE ANSWER? ethic and ideology, they, too, will symbolically become Jewish. There will then be only man. Arrow Zip Fasteners (Pvt) Ltd.
Crown Clothing Co. (Pvt) Ltd. I Fintz & Son (Pvt) Ltd. Flair Furniture Co. (Succ) (Pvt) Ltd.
Inter-Continental Leaf Tobacco Co (Pvt) Ltd.
Machine Tools & Accessories (Pvt) Ltd.
Mining & Engineering Agencies (Harare) (Pvt) Ltd.
Winfields Clothing Manufacturers (Pvt) Ltd. The publication of this commemorative book was made possible through the generosity of the following donors. have been used and wishes to thank the authors.